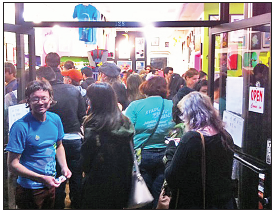 QPop co-owner Chris Mitchell, left, welcomes some of the throngs of visitors on Saturday night. In honor of the 20th anniver­sary of the popular cartoon “Sailor Moon,” Q Pop in Little Tokyo’s Weller Court is hosting a group show celebrating the characters. An event was held Saturday with thousands in attendance – many in costume – and video of the show projected on an outdoor screen. The event continues through Sunday, April 20, with works by artists includ­ing Miss Kika, Perry Maple, Joey Chou, Madoka Kinoshita, Crowded Teeth Cameron Garland and Ruriko Maruyama. QPop is located at 128 Astronaut Ellison S. Onizuka St. Call (213) 687-7767 for more information.